High Shoal Falls located in the far southern reaches of the Blue Ridge Mountains is likely the most spectacular and accessible waterfall in Towns County. The High Shoal Falls Scenic Area is comprised within 170 acres of the Chattahoochee National Forest. Within this region are cascading mountain creeks and streams, hardwood forest, seasonal wildflowers, natural wildlife and an abundance of Mountain Laurel and Rhododendron often lining both sides of the trail for some distance at a time. Access to High Shoals Falls Scenic Area is just off GA 75 along the eastern side of the highway and marked by a small forestry road sign. As with many unpaved forestry roads the trip can be a little bouncy at times and includes a wide un-bridged creek bed that that your vehicle can cross near the beginning of the approach roadway to the upper trailhead. 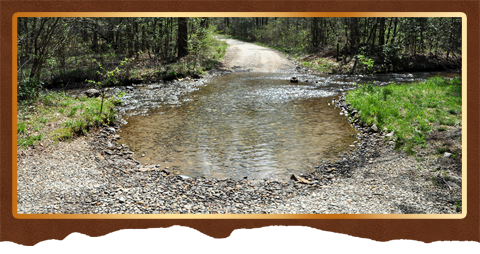 During rainy weather the creek bed can rise and the road can be muddy requiring the need of a four-wheel drive vehicle to cross the rising water and to pull the uphill grade. Never try to cross a strong current with your vehicle, strong currents can lift a vehicle off their wheels. During my first visit I used a standard size vehicle, the forestry road was dry and the creek was low, the trip was just a little bumpy in places. The creek makes for a good family vehicle splashing photo or video.